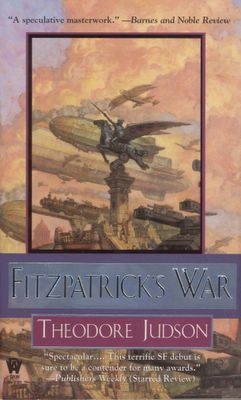 Fitzpatrick’s War, the first novel by Theodore Judson, takes the form of a memoir, also named Fitzpatrick’s War, now being republished in its second edition in the year (very much of our Lord) 2591. The memoir’s author, one Sir Robert Bruce, venerable and guilt-ridden former officer of the world-spanning Yukon Confederacy, has put pen to paper to set the record of his master Fitzpatrick’s conquests straight. In the book-within-a-book, Bruce relates the eventful years of his youth, from his teenage years as a common solider fighting on the Mexican frontier through his meeting with future conqueror Isaac Fitzpatrick and the war they waged together against a nearly helpless world. Bruce’s story is compelling enough, with its futuristic and yet somehow nostalgic tales of war waged with steam-powered jet aircraft, zeppelins, and “firesticks,” which seem to be some sort of portable napalm that melts terrain and enemy alike into glass. Bruce’s world overflows with treachery, intrigue, male bonding, beautiful women, mad scientists, snappy uniforms, exotic but gallant Noble Savages; if "Tarzan" and "John Carter of Mars" creator Edgar Rice Burroughs were alive today, he may have written something quite like this…with one important difference: he would not have included the editorial notes that give the memoir its vital context. As we are told in the “Introduction to the Annotated Edition,” this version of Fitzpatrick’s War is being published on the fiftieth anniversary of the first edition – not to bring a celebrated work back into print, but to expose the memoir as a treacherous lie. For the editor of Bruce’s work puts himself firmly on the side of orthodoxy in a decades-long controversy over the veracity of Bruce’s claims. In the world of 2591, Fitzpatrick is venerated, his short rule a Golden Age, his war the high point of an empire’s proud history. Bruce’s work calls this version of history into question, and since it’s too late to suppress the book, it must at least be smeared as a pack of lies. This unusual construction means that the book has two audiences: the audience of the real world of 2005, who read a rousing SF adventure story, and the imaginary audience of 2591, reading a controversial historical record, engaged in a one-way “conversation” with the work’s editor, named only once as “Ro.” We, the audience of reality, are invited, indeed almost forced, by this construction to consider the reactions of the fictional reader, the one constantly assured and patronized by the editor, the one who must perhaps read the book, if not in hiding, than at least with a sense of a man reading a comic book on a subway: embarrassed, guilty pleasure. The book raises a number of interesting issues, most especially the power that publishers have over authors. Thanks to the ever present editor’s footnotes, we are constantly reminded that “this passage was not included in the 2541 edition,” or “Bruce is obviously lying here; see Gerald, page 541.” And yet, the essential, terrible truth of Bruce’s account is all too clear to any but the dullest reader: not only was Fitzpatrick’s global war an unjust atrocity, a holocaust, the reader himself must be aware that he is living in a repressive, if not wholly bleak, society. We are even led to wonder whether this 2591 edition is truly the unexpurgated text or if, as in the 2541 edition, several passages have been Bowdlerized or outright omitted? Or is this, in fact, the editor’s true purpose? While the text is studded with footnotes that constantly call into question Bruce’s character, a deeper reading reveals that the mysterious Ro may, in fact, be playing a very dangerous and subversive game. Bruce’s account is permeated with the ring of truth, since Bruce himself is merciless with regards to his own weaknesses and his participation in Fitzpatrick’s peerless atrocities. His love for his wife Charlotte, his empathy for the Chinese, Indian and African citizens he encounters while at war (whom in his neo-Victorian culture are seen as subhuman), his attempts to mitigate the effects of Fitzpatrick’s war, his loyalty to his friends and even his inevitable, justified betrayal of Fitzpatrick all encourage the reader – both of 2005 and 2491 – to see Bruce’s record as true. The editor’s constant attacks on Bruce’s text become more and more transparent and serving of the current ruling regime with every page. A very telling passage, for it reveals that the role of history itself has been subverted in this culture; its purpose is to uphold virtue, presumably those virtues held in esteem by the current ruling class. Ro is taking great pains to explain why he has undertaken what is obviously seen as a dubious enterprise, one questioned by his academic peers. He doth protest too much, it seems, and it is in the book’s afterword that Ro’s true purpose can be divined. Ro rants for a time about Bruce’s supposed lies, and yet he gives the final word to the account of a humble fisherman, Edward Tolde, who knew Sir Robert and his family in their later years and told his story to a magazine writer named Cather. The fisherman goes on to relate how the aged Bruce saved some Nipponese sailors from a lynching, and details some of his “scandalous” behaviour with his wife – scandalous in that he was known to dance with her or kiss her palms in public, lewd and unseemly acts in the Yukon Confederacy. It is a wholly sympathetic portrait, completely undermining all Ro’s words, cementing in the readers’ minds the truth of Bruce’s account. So in the end, we are left to wonder: is the world of 2491 so repressive that Ro actually believes every word he writes about Bruce, without irony, unaware that some of his readers (at least the “real” readers of 2005) will be compelled to take a viewpoint to which he is ostensibly opposed? Am I, as one of those readers of 2005, merely imprinting my cultural mores on the imaginary editor? Or is there reason to hope that the world of 2491 is at last beginning to change, to question its own history? Is Ro a fundamentally honest historian, bringing a controversial work back into the public eye in the only way he can, given the restrictions of his time? Only one thing is certain: history, yet again, has been written by the winners. But it can be rewritten, the truth brought back to the fore, if some of those winners can follow the dictates of their conscience. A Little-Known "Reserve Activation Clause"